By Carolyn Roy Carolyn@natchitochestimes.com If you think your phone rings a lot, consider the number of calls for police service handled by the Natchitoches Police Dept. 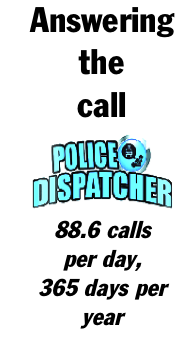 (NPD) in 2017—-32,348 non-emergency and emergency related calls. That statistic is among many included in the NPD 2017 Crime Statistics report compiled by Capt. Christopher Payne, Division Commander of Administration. Payne’s report is divided into traffic and patrol, criminal investigations, narcotics and records divisions. Payne says there is no consistency in why some areas are up and some are down. While the number of arrests is up in 2017, the number of cases were down. Often there is more than one arrest in a case. He cites concerned citizens getting involved as a reason for more calls. “They’re tired of being intimidated, especially our older citizens. We are pumping more units in those areas.” In the juvenile department, both the number of arrests and the number of cases are down. “Our core message to the community is that we need aggressive parenting,” Payne says. NPD arrested 3,312 adults during 2017. The report shows the arrest rate climbing since 2014 when there were 1,417 adults arrested; in 2015, there were 1,442 adults; and in 2016, 2,106 adults arrested. In 2017, the department investigated two homicides, 13 attempted homicides, 14 robberies, 195 batteries, 470 thefts, 239 damages to property and 542 burglaries. The department posted a 34.2 percentage of cleared cases rate, higher than the 29.4 percent cleared in the previous year. In the juvenile division, NPD had a 63.4 percent clearance rate for the 197 arrests of 95 males and 102 females. In the area of narcotics arrests, possession of marijuana and crack cocaine remain the most frequent violations. NPD seized 142 pounds of marijuana and 185 grams of crack cocaine. There were 62 guns seized, four vehicles and $42,211 in currency. The Records Division collected $461,660 for 14 areas of violations. The largest collection amounts were $272,387 for traffic tickets and $80,500 for 574 LACE traffic tickets. LACE is Local Agency Compensation Enforcement in which revenue from tickets is shared by NPD and the District Attorney’s office. The division collected $35,746 in bench warrant fees and $40,780 in criminal charges. In the traffic and patrol division there were 4,502 citations issued for the following traffic offense: Seat Belt: 766 Speeding: 1,286 Red Light Violations: 206 DWI: 51 Miscellaneous: 2,193.